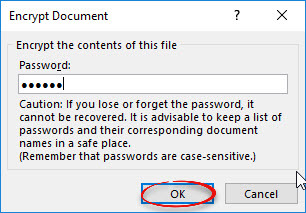 How to prevent people from opening an Excel file unless they have a password you've applied. This article shows Excel 2016, but this process also works in Excel 2013 & 2010. Step 1:Click the File tab, then select Info. 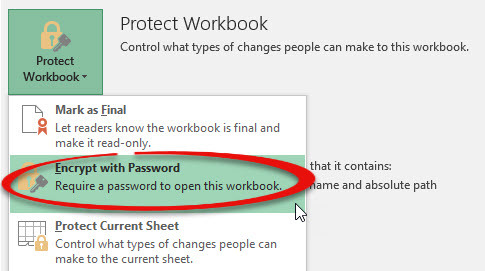 Click Protect Workbook. Step 2:Choose Encrypt with Password. Step 3:Type a password that you won’t forget. Click OK. Step 4:Enter the password again. Click OK. Step 5:The password is applied. Step 6:You may save the file in your public folder. 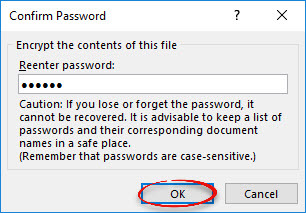 Tell the other person(s) what the password is to open it.Step 7:Have the person(s) open the file and enter the password, then click OK.